Calculating distances in CC3D simulations. Looping over select cell types. Finding cell in the inventory. Writing data files in the simulation output directory. Steering – changing CC3DML parameters on-the-fly. Steering – changing Python parameters using Graphical User Interface. Cell Motility. Applying force to cells. Controling steppable call frequency. Stopping simulation on demand or increasing maximum Monte Carlo Step. Changing cluster id of a cell. In the previous section we outlined how to programmatically change CC3DML parameters. In this section we will show you how to create a graphical panel where you can use sliders and or pull down list to control parameters defined in the Python scripts. this type of interaction is very desirable because you can try different values of parameters without writing complicated procedural code that alters the parameters. It also provides you with a very convenient way to create truly interactive simulations. In our demo suite we have included examples (e.g. Demos/SteeringPanel/steering_panel_demo) that demonstrate how to setup such interactive simulations. In this section we will explain all coding that is necessary to accomplish this task. 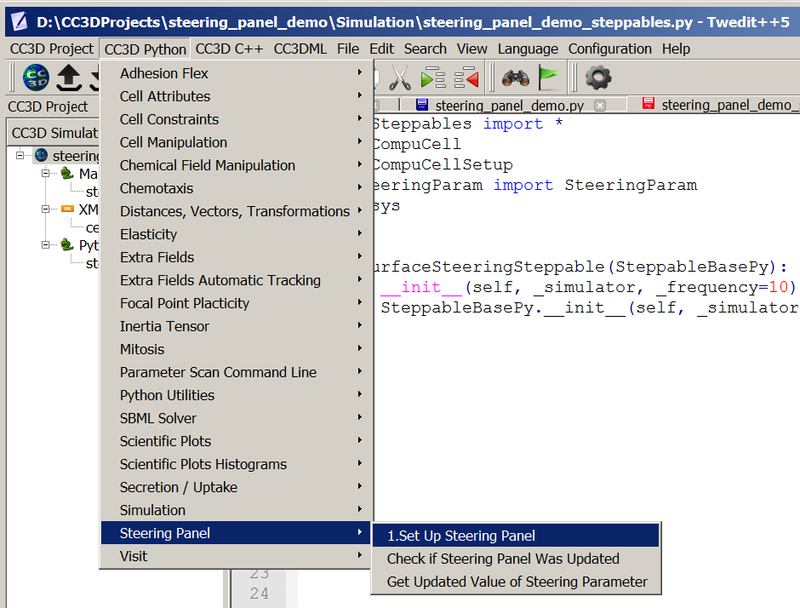 All the code that is necessary to get steering panel for Python parameters working will reside in Python steppable file. Inside process_steering_panel_data (the function has to be called exactly that) we read the current value indicated in the steering panel using convenience function get_steering_param . In our example we are reading two parameter values from the panel -target_val and lambda_val. Once we fetched the values from the panel we iterate over all cells and modify targetVolume and lambdaVolume parameters of every cell. As you can see by adding two functions to the steppable - add_steering_panel and process_steering_panel_data you can create truly interactive simulations where you can have a direct control over simulations. Tool like that can be especially useful in the exploratory phases of your model building where you want to quickly see what impact a given parameter has on the overall simulation. © Copyright 2017, Maciej Swat, Julio Belmonte Revision 144470d3.